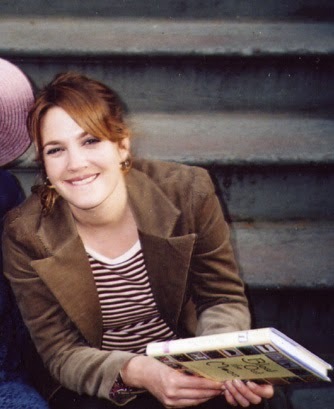 Yes, that is Drew Barrymore -- the picture was taken on the steps of my building in Boston, while they were filming Feverpitch. The pink hat is mine, but I (wisely, I think) cropped myself out of the picture. Ordinary people rarely come off well when photographed with celebrities -- especially when the celebrities are young, beautiful movie stars. I asked her to pose with it thinking it might be a good ad for the book -- of course, it wasn't! That was predictable. But other things about what will grab people's attention aren't predictable at all. Of all the things I ever posted here, the one about my shepherd's hut was read the most (4,000 and something times). That wasn't even meant to be anything but fun for me to write about and interesting to my friends. And when it comes to other people's posts, there's no pattern either: what people read most and what they didn't seems completely random (and NOT related to even what readers said were their favorites, in the days when we asked). The most visited posts on this blog were (in this order): Elaine's about Valerie worth's animal poems, that shepherd's hut post of mine, Grace's moon craft festival post (about how to make a lantern for a moon festival), Alvina's Day in the Life of an Editor, and a sneak peek of Anna's sketch of a girl. Who would ever have guessed that? I think the lesson when it comes to writing (whether a book or a blog post!) is to just write what interests YOU.